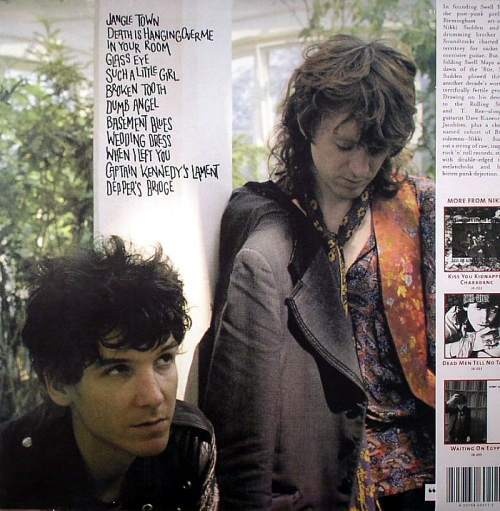 Tracklist: Jangle Town/ Death Is Hanging Over Me (*)/ In Your Room/ Glass Eye/ Such A Little Girl/ Broken Tooth(*)// Dumb Angel/ Basement Blues/ Wedding Dress/ When I Left You (*)/ Captain Kennedy's Lament/ Deppers Bridge. 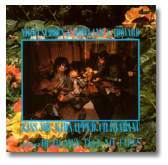 Recording info: Recorded @ Woodbine St Recording Studio,Leamington Spa (UK) between 16-Jun-86 and 04-Jul-86. Engineered and produced by John A. Rivers. 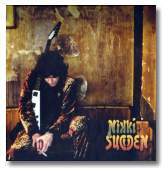 Line-up: Nikki Sudden (vocals, guitar, organ) and Epic Soundtracks (guitar, piano, percussion, drums) with guests: Duncan Sibbald (bass)/ Jonathan Hodgson (bass, viola, violin) and (*) Rowland S.Howard (guitars). 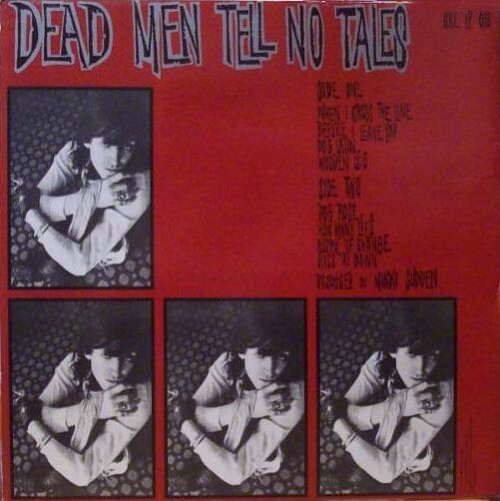 Tracklist: "Dead Men Tell No Tales": When I Cross The Line/ Before I Leave You (*)/ Dog Latin/ Girl With The Wooden Leg (*)/ Dog Rose/ How Many Lies (*)/ Cupful Of Change (*)/ Kiss At Dawn. 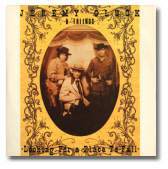 "Texas": Jangle Town/ Death Is Hanging Over Me (*)/ In Your Room/ Glass Eye/ Such A Little Girl/ Broken Tooth(*)/ Dumb Angel-Stuka/ Basement Blues/ Wedding Dress/ When I Left You (*)/ Captain Kennedy's Lament (vocal)/ Captain Kennedy (Instrumental). 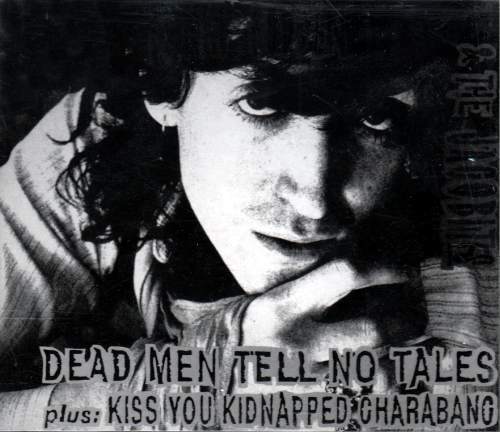 Recording info: "Dead Men Tell No Tales" recorded @ (Fairport Dave Pegg’s) Woodworm Studio, Barford St. Michael (UK) between August and September 1986. Engineered by Tim Matyear. Produced by Nikki Sudden. 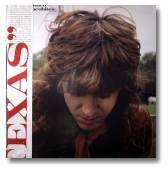 "Texas" recorded @ Woodbine St Recording Studio,Leamington Spa (UK) between 16-Jun-86 and 04-Jul-86. Engineered and produced by John A. Rivers. 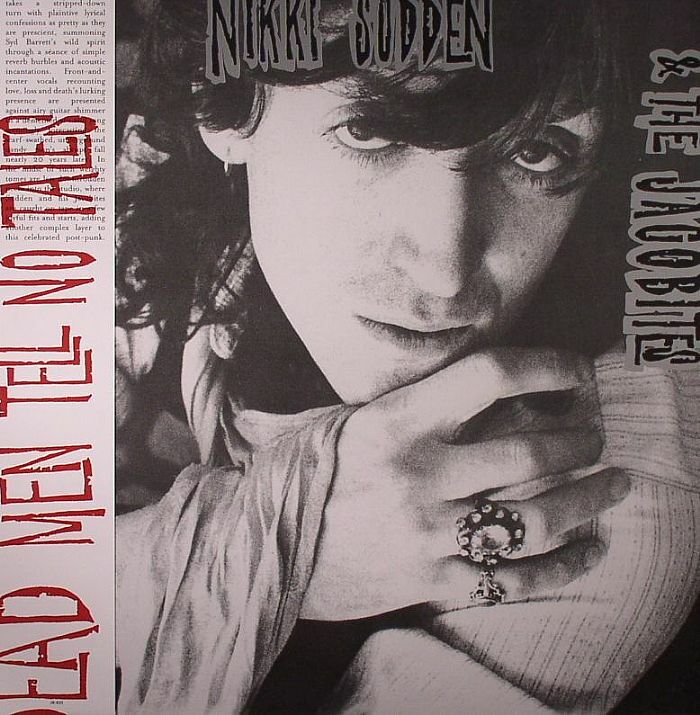 Line-up: "Dead Men Tell No Tales": Nikki Sudden (vocals, guitar, bouzouki, dulcimer, harmonium, piano) with guests: Duncan Sibbald (bass, acoustic guitar)/ Andrew Bean (tambourine, guitar) and (*) Rowland S.Howard (guitars, organ). 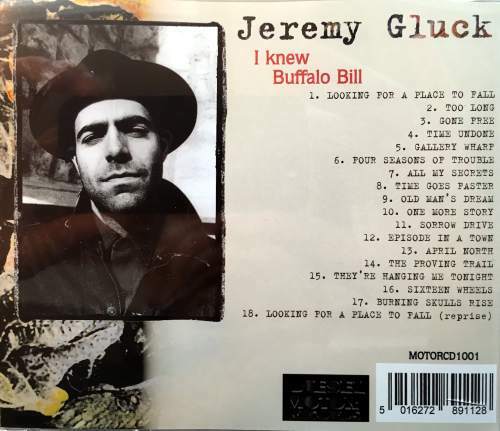 Tracklist: "Texas": Back To The Coast (+)/Jangle Town/ Death Is Hanging Over Me (*)/ In Your Room/ Glass Eye/ Such A Little Girl/ Broken Tooth (*)/ Suitcase (+)/ Dumb Angel-Stuka/ Basement Blues/ Wedding Dress/ When I Left You (*)/ Captain Kennedy's Lament/ Deppers Bridge/ Breaking Lines (+)/ The Last Bandit (+)/ When You're Alone (+)/ Misty Roads (aka Death Is Hanging Over Me) (+). 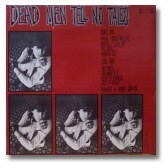 "Dead Men Tell No Tales": Flowerbed Romance (+)/ When I Cross The Line/ Before I Leave You/ Dog Latin/ When She Smiles (+)/ Sailors Of The Highway (+)/ Death Is Hanging Over Me (early version)(+)/ Dog Rose/ Cavaliers (+)/ How Many Lies/ Cupful Of Change/ The Ragged School (+)/ Girl With The Wooden Leg/ Kiss At Dawn. 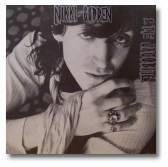 Recording info: "Texas" recorded @ Woodbine St Recording Studio,Leamington Spa (UK) between 16-Jun-86 and 04-Jul-86. 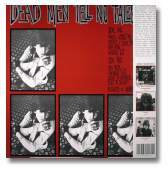 Engineered and produced by John A. Rivers; "Dead Men" recorded @ (Fairport Dave Pegg’s) Woodworm Studio, Barford St. Michael (UK) between August and September 1986. Engineered by Tim Matyear. 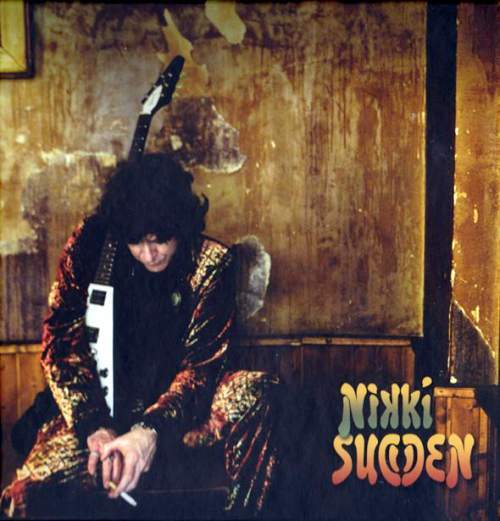 Produced by Nikki Sudden. 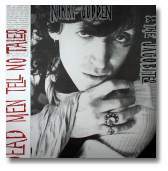 Extra tracks for "Dead Men" recorded @ Ulan Bator Studio, Hamburg (DE) during September 1985 by Christian Hartje, @ (Fairport Dave Pegg’s) Woodworm Studio, Barford St. Michael (UK) during November 1985 and August/September 1986 and March 1987 by Tim Matyear, and @ Woodbine St Recording Studio,Leamington Spa (UK) in 1988 by John A. Rivers. Note 1: "Texas" album comes with 6 bonus tracks (+), "Dead Men" album also with 6 bonus tracks (+). 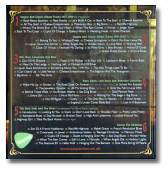 "Misty Roads (aka Death Is Hanging Over Me)" previously released on "Egyptian Roads" CD compilation (Indies 1997). Digitally remastered by Nikki Sudden and John A. Rivers @ WSRS in November 2000. 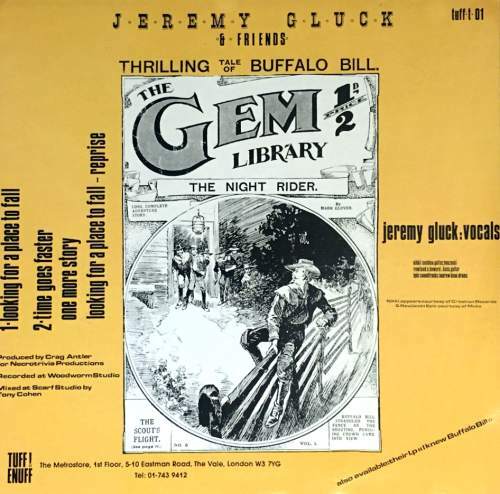 Note 2: "Jangle Town", "Flying (pt A)", "Misty Roads (aka Death Is Hanging Over Me)", "The Last Bandit", "Suitcase", "Russian River", "Going Down To The Underworld", "Honey Baby" and "Dumb Angel-Stuka" from the "Texas" sessions were later used by film director Mika Kaurismäki for his 2004 film "Honey Baby". 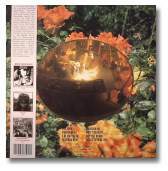 Note: With OBI, Inner sleeve with lyrics/credits. Tracklist: When I Cross The Line/ Before I Leave You (*)/ Dog Latin/ Girl With The Wooden Leg (*)// Dog Rose/ How Many Lies (*)/ Cupful Of Change (*)/ Kiss At Dawn. 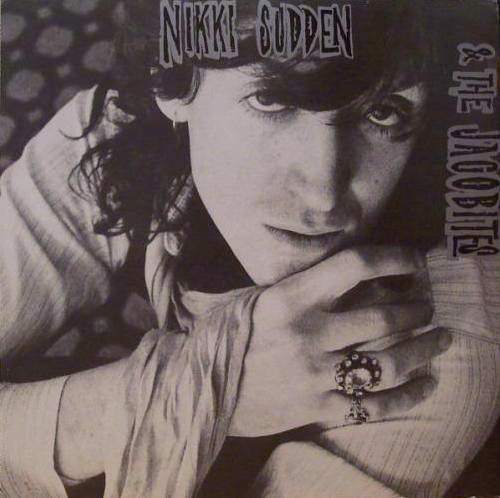 Recording info: Recorded @ (Fairport Dave Pegg’s) Woodworm Studio, Barford St. Michael (UK) between August and September 1986. Engineered by Tim Matyear. Produced by Nikki Sudden. 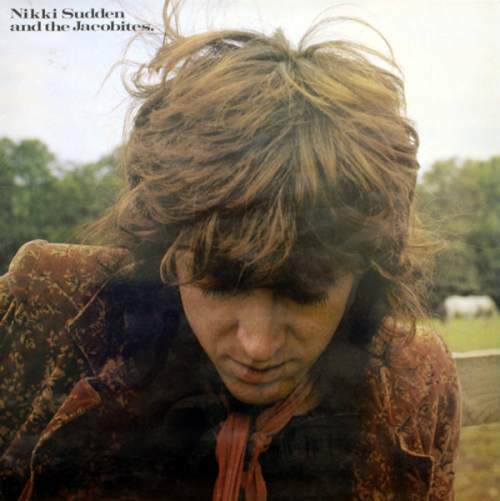 Line-up: Nikki Sudden (vocals, guitar, bouzouki, dulcimer, harmonium, piano) with guests: Duncan Sibbald (bass, acoustic guitar)/ Andrew Bean (tambourine, guitar) and (*) Rowland S.Howard (guitars, organ). 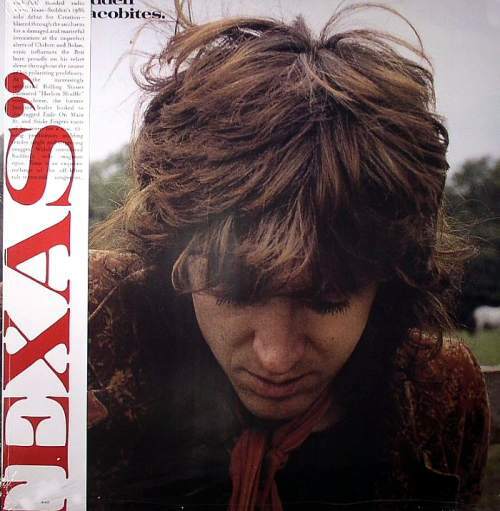 Recording info: "Texas" recorded @ Woodbine St Recording Studio,Leamington Spa (UK) between 16-Jun-86 and 04-Jul-86. Engineered and produced by John A. Rivers; "Dead Men" recorded @ (Fairport Dave Pegg’s) Woodworm Studio, Barford St. Michael (UK) between August and September 1986. Engineered by Tim Matyear. Produced by Nikki Sudden. 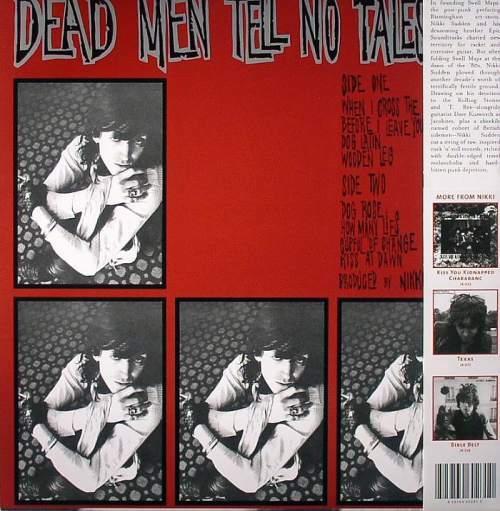 Extra tracks for "Dead Men" recorded @ Ulan Bator Studio, Hamburg (DE) during September 1985 by Christian Hartje, @ (Fairport Dave Pegg’s) Woodworm Studio, Barford St. Michael (UK) during November 1985 and August/September 1986 and March 1987 by Tim Matyear, and @ Woodbine St Recording Studio,Leamington Spa (UK) in 1988 by John A. Rivers. 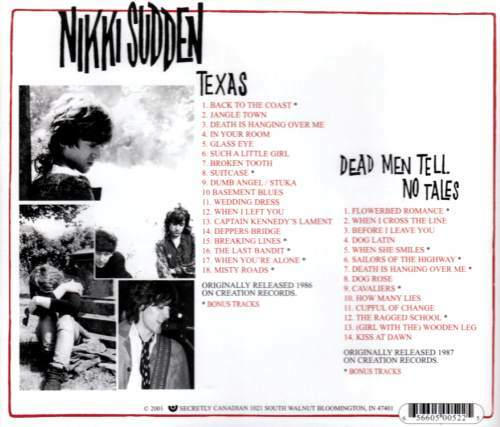 Note 1: "Texas" album comes with 6 bonus tracks (+), "Dead Men" album also with 6 bonus tracks (+). 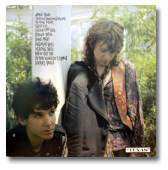 "Misty Roads (aka Death Is Hanging Over Me)" previously released on "Egyptian Roads" CD compilation (Indies 1997).Digitally remastered by Nikki Sudden and John A. Rivers @ WSRS in November 2000. Recording info: Recorded @ (Fairport Dave Pegg’s) Woodworm Studio, Barford St. Michael (UK) between August and September 1986. Engineered Tim Matyear. Produced by Nikki Sudden. Tracklist: Looking For A Place To Fall/ Too Long/ Gone Free/ Hymn (*)/ Time Undone// Gallery Wharf (The Ragged School)/ Four Seasons Of Trouble (*)/ All My Secrets (*). Recording info: Recorded @ (Fairport Dave Pegg’s) Woodworm Studio, Barford St. Michael (UK) between September and October 1986. Engineered by Tim Matyear. Produced by Crag Antler. Overdubs and mixing @ the Scarf Studio, Mile End-South London, by Nigel Palmer and Tony Cohen during December 1986/January 1987. 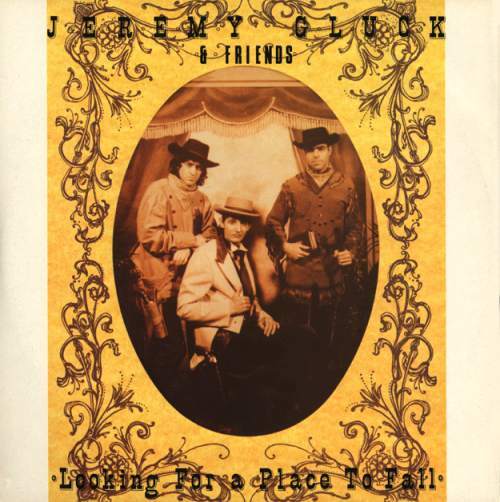 Line-up: Jeremy Gluck (vocals)/ Nikki Sudden (vocals, guitars, bouzouki)/ Rowland S.Howard (bass, guitars, organ, snare drum)/ Jonathan Hodgson (violin)/ Andrew Bean (drums)/ Epic Soundtracks (drums) and Jeffrey Lee Pierce (guitars) (*). Extra's: Time Goes Faster (+)/ Old Man’s Dream)/ One More Story (+)/ Sorrow Drive (++)/ Episode In A Town (++)/ April North (++)/ The Proving Trail (++)/ They’re Hanging Me Tonight (++)/ Sixteen Wheels/ Burning Skulls Rise (++)/ Looking For A Place To Fall(reprise) (+). 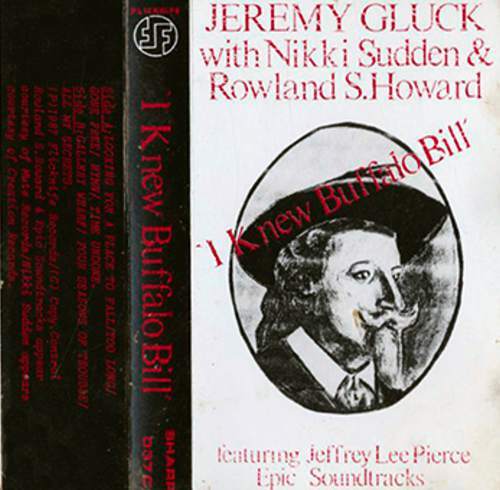 Recording info: "I Knew Buffalo Bill" and "Looking For A Place To Fall": recorded @ (Fairport Dave Pegg’s) Woodworm Studio, Barford St. Michael (UK) between September and October 1986. Engineered by Tim Matyear. Produced by Grag Antler. 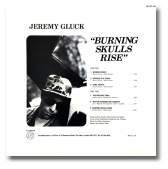 Overdubs and mixing @ the Scarf Studio, Mile End-South London, by Nigel Palmer and Tony Cohen during December 1986/January 1987; "Burning Skulls Rise": recorded @ (Fairport Dave Pegg’s) Woodworm Studio, Barford St. Michael (UK) during July 1987. Engineered by Tim Matyear. 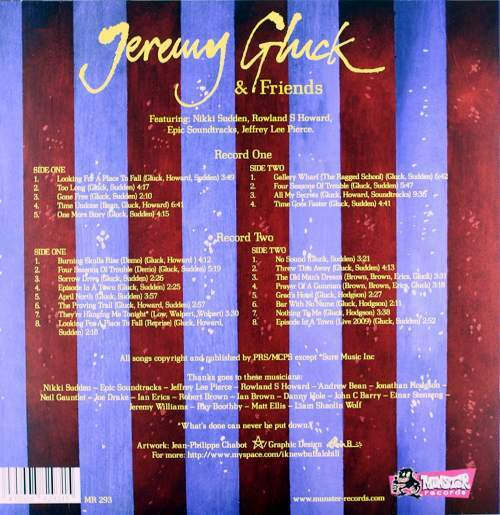 Produced by Jeremy Gluck and Joe Drake. Overdubs and mixing @ the Arkantide Studio, London, by Phil Castang during February 1988; "Sorrow Drive" recorded @ the Sunday School studios, London during July 1987 by Speaker Dave. 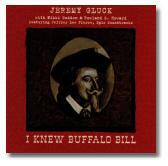 Note: "I Knew Buffalo Bill" album, combined with the "Looking For A Place To Fall" (+) single and the "Burning Skulls Rise" (++) mini album. 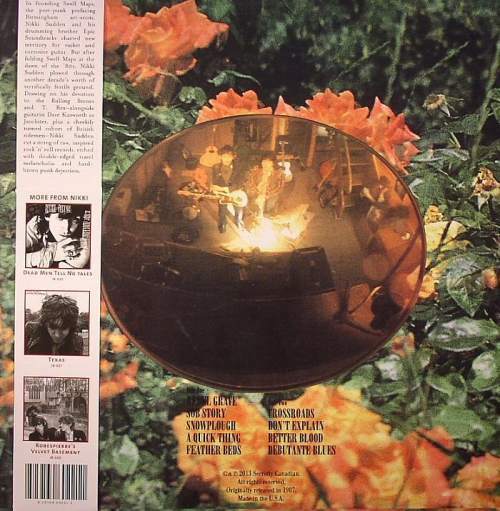 Omits "Hymn" from the orginal LP. 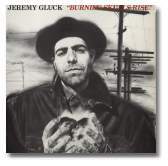 Adds "Old Man’s Dream" (Jeremy Gluck with the Harbour Kings recorded @ the Sunday School studios, London during 1988 and "Sixteen Wheels" (Jeremy Gluck recorded during 1988), none of which are with Nikki Sudden and Rowland S.Howard. 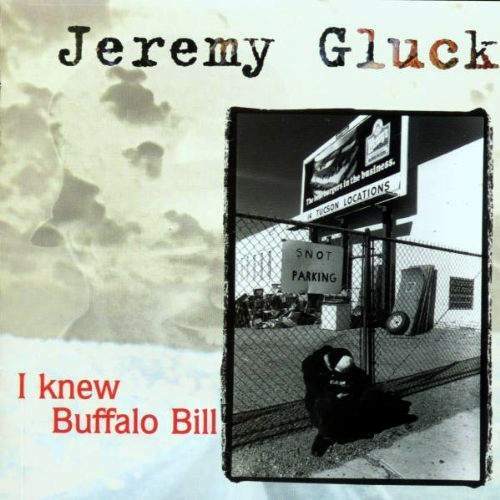 Line-up: Jeremy Gluck (vocals)/ Nikki Sudden (vocals, guitars, bouzouki)/ Rowland S.Howard (bass, guitars, organ, snare drum)/ Jonathan Hodgson (violin)/ Andrew Bean (drums)/ Epic Soundtracks (drums) and Jeffrey Lee Pierce (guitars) (*). Joe Drake (bass) on the "Burning Skulls Rise" mini album. 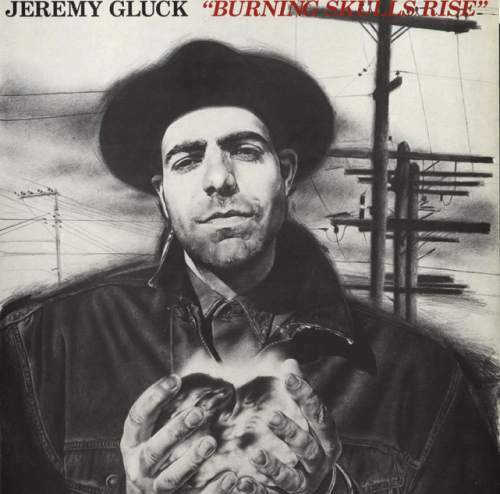 Burning Skulls Rise (demo)/ Four Seasons Of Trouble (demo)/ Sorrow Drive (++)/ Episode In A Town (++)/ April North (++)/ The Proving Trail (++)/ They’re Hanging Me Tonight (++)/ Looking For A Place To Fall(reprise) (+)// No Sound/ Threw This Away/ The Old Man's Dream (demo 1988)/ Prayers Of A Gunman (demo 1989)/ Grad's Hotel (demo 1989)/ Bar With No Name (demo 1989)/ Nothing To Me (demo 1989)/ Episode In A Town (live 2009). 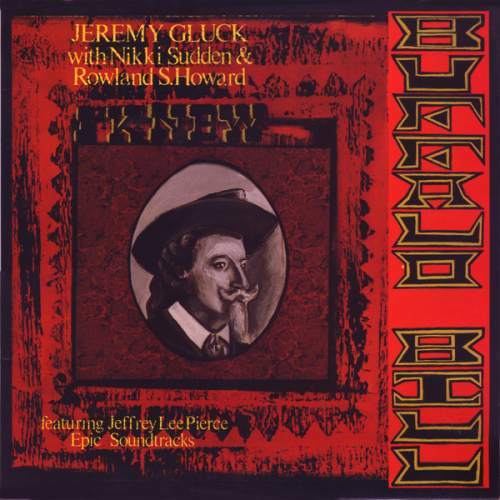 Recording info: "I Knew Buffalo Bill" and "Looking For A Place To Fall": recorded @ (Fairport Dave Pegg’s) Woodworm Studio, Barford St. Michael (UK) between September and October 1986. Engineered by Tim Matyear. Produced by Grag Antler. Overdubs and mixing @ the Scarf Studio, Mile End-South London, by Nigel Palmer and Tony Cohen during December 1986/January 1987; "Burning Skulls Rise": recorded @ (Fairport Dave Pegg’s) Woodworm Studio, Barford St. Michael (UK) on 04-Jun-87 and 18/22-Jul-87. Engineered by Tim Matyear. 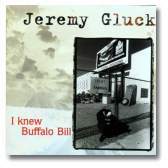 Produced by Jeremy Gluck and Joe Drake. Overdubs and mixing @ the Arkantide Studio, London, by Phil Castang during February 1988; "Sorrow Drive" recorded @ the Sunday School studios, London during July 1987 by Speaker Dave. 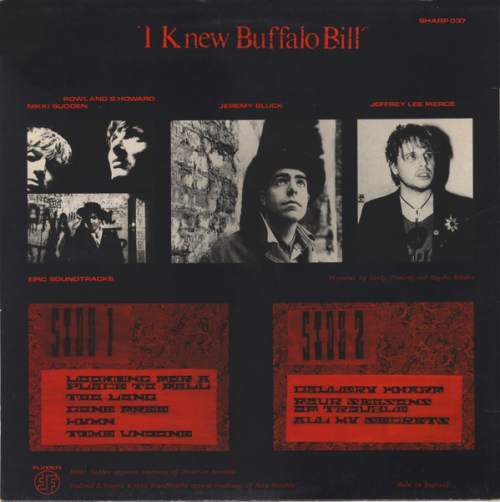 Note: "I Knew Buffalo Bill" (*) album, combined with the "Looking For A Place To Fall" (+) single and the "Burning Skulls Rise" (++) mini album. 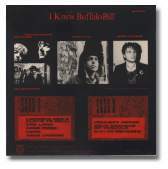 Omits "Hymn" from the orginal "Buffalo" LP. 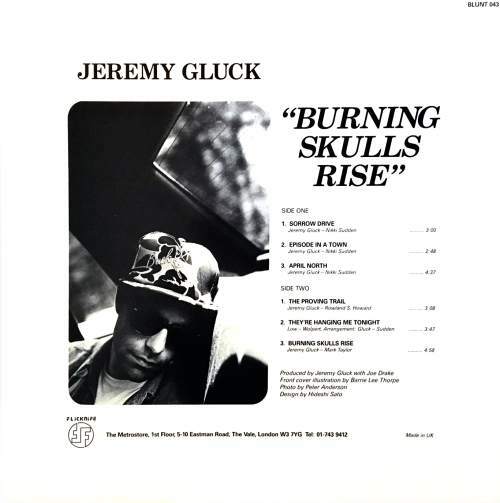 Omits "Burning Skulls Rise" from the orginal mini album, but replaces it with a demo version and adds "No Sound" and "Threw This Away" from the same sessions. 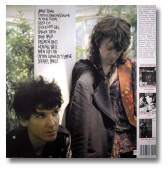 Adds demos from 1988-89, none of which are with Nikki Sudden and Rowland S.Howard. 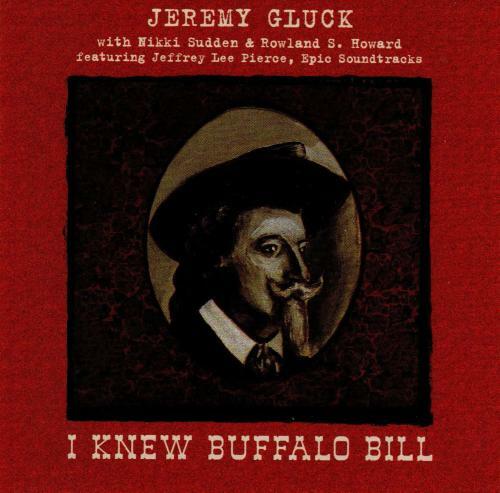 Line-up: Jeremy Gluck (vocals)/ Nikki Sudden (vocals, guitars, bouzouki)/ Rowland S.Howard (bass, guitars, organ, snare drum)/ Jonathan Hodgson (violin)/ Andrew Bean (drums)/ Epic Soundtracks (drums) and Jeffrey Lee Pierce (guitars) (-). Joe Drake (bass) on the "Burning Skulls Rise" mini album. Tracklist: Looking For A Place To Fall// Time Goes Faster/ One More Story. Tracklist: Sorrow Drive/ Episode In A Town/ April North// The Proving Trail/ They’re Hanging Me Tonight/ Burning Skulls Rise. 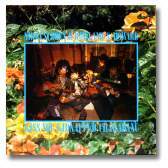 Recording info: Recorded @ (Fairport Dave Pegg’s) Woodworm Studio, Barford St. Michael (UK) on 04-Jun-87 and 18/22-Jul-87. Engineered by Tim Matyear. 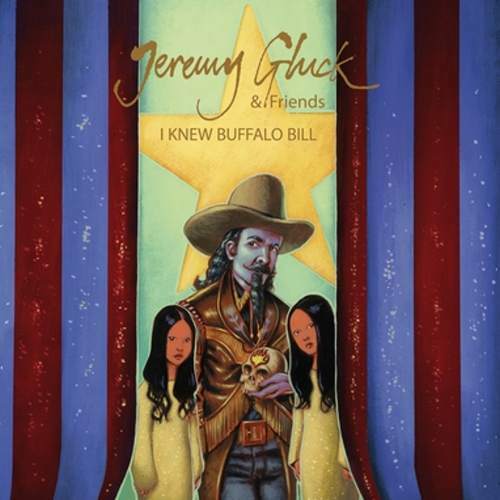 Produced by Jeremy Gluck and Joe Drake. Overdubs and mixing @ the Arkantide Studio, London, by Phil Castang during February 1988. Line-up: Jeremy Gluck (vocals)/ Nikki Sudden (vocals, guitars, bouzouki)/ Rowland S.Howard (guitars, organ, snare drum)/ Joe Drake (bass)/ Jonathan Hodgson (violin)/ Andrew Bean (drums) and Epic Soundtracks (drums). 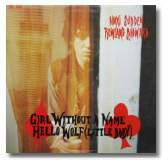 Tracklist: Wedding Hotel/ Hello Wolf (Little Baby)// Girl Without A Name/ Wedding Hotel (original mix). Recording info: Recorded @ (Fairport Dave Pegg’s) Woodworm Studio, Barford St. Michael (UK) between September and October 1986. Engineered by Tim Matyear. 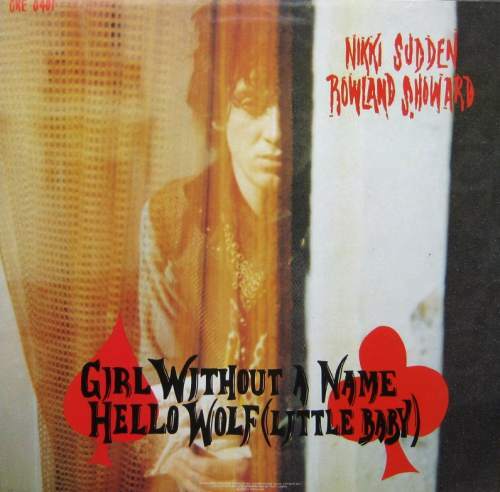 Produced by Nikki Sudden and Rowland S. Howard. 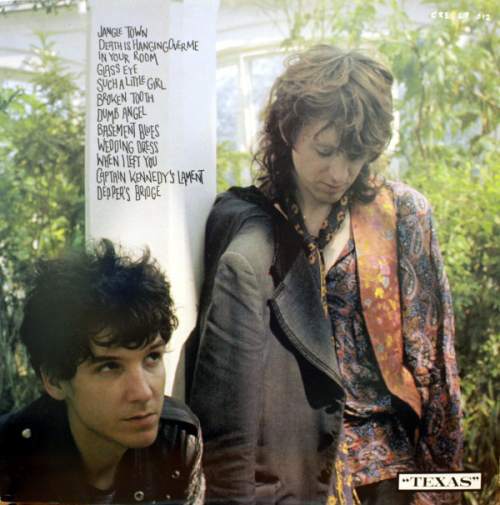 A-side remixed @ the Scarf Studio, Mile End-South London, by Tony Cohen during December 1986. 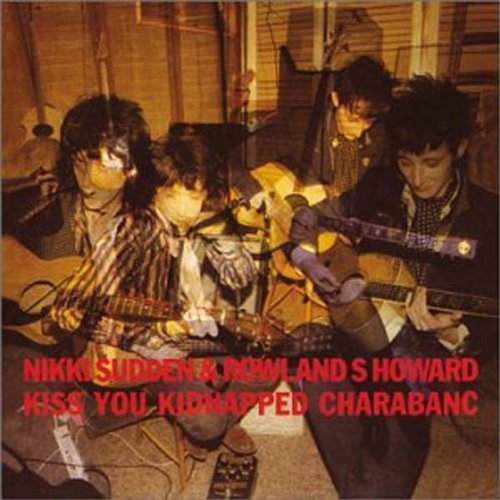 Line-up: Nikki Sudden (vocals, guitar, bouzouki) and Rowland S.Howard (guitars, organ, dulcimer, harmonium, drums, bouzouki) with guest: Andrew Bean (drums). 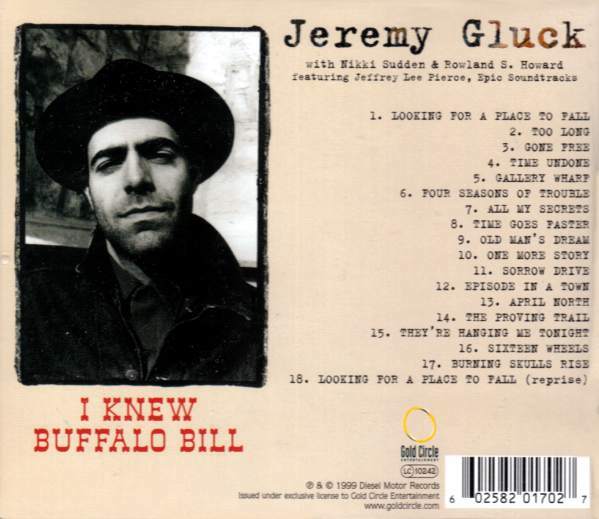 Tracklist: Rebel Grave/ Sob Story/ Snowplough (long version)/ A Quick Thing/ Feather Beds// Crossroads/ Don't Explain [Arthur Herzog/Billie Holiday]/ Better Blood/ Debutante Blues. Recording info: Recorded @ (Fairport Dave Pegg’s) Woodworm Studio, Barford St. Michael (UK) between September and October 1986. Mixed between 09/12-Mar-87. Engineered by Tim Matyear. 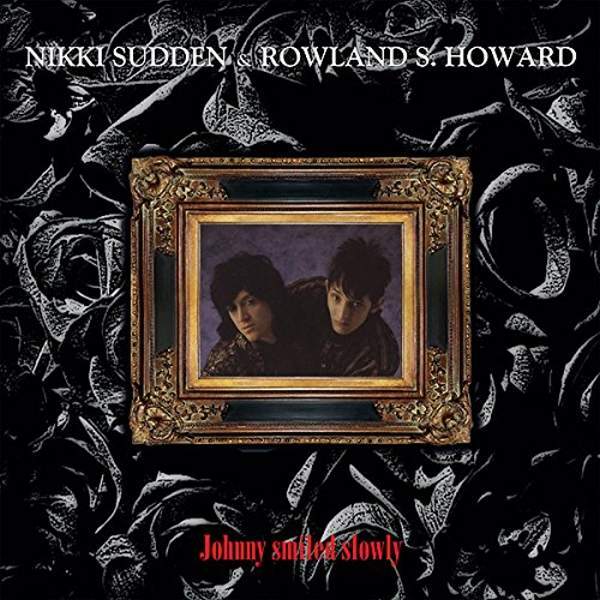 Produced by Nikki Sudden and Rowland S. Howard. 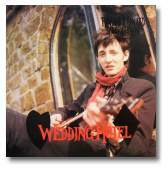 Line-up: Nikki Sudden (vocals, guitar, bouzouki) and Rowland S.Howard (guitars, organ, dulcimer, harmonium, drums, bouzouki) with guests: Genevieve McGuckin (harmonium)/ Andrew Bean (drums) and Epic Soundtracks (drums, percussion). Tracklist: "Kiss You": Rebel Grave/ Sob Story/ Snowplough/ A Quick Thing/ Feather Beds// Crossroads/ Don't Explain [Arthur Herzog/Billie Holiday]/ Better Blood/ Debutante Blues. "Dead Men Tell No Tales": When I Cross The Line/ Before I Leave You (*)/ Dog Latin/ Girl With The Wooden Leg (*)// Dog Rose/ How Many Lies (*)/ Cupful Of Change (*)/ Kiss At Dawn. 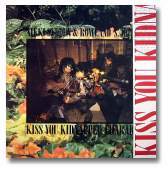 Recording info: "Kiss You" recorded @ (Fairport Dave Pegg’s) Woodworm Studio, Barford St. Michael (UK) between September and October 1986. Mixed between 09/12-Mar-87. Engineered by Tim Matyear. 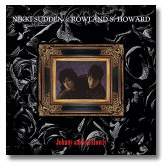 Produced by Nikki Sudden and Rowland S. Howard. "Dead Men" recorded @ (Fairport Dave Pegg’s) Woodworm Studio, Barford St. Michael (UK) between August and September 1986. Engineered Tim Matyear. Produced by Nikki Sudden. 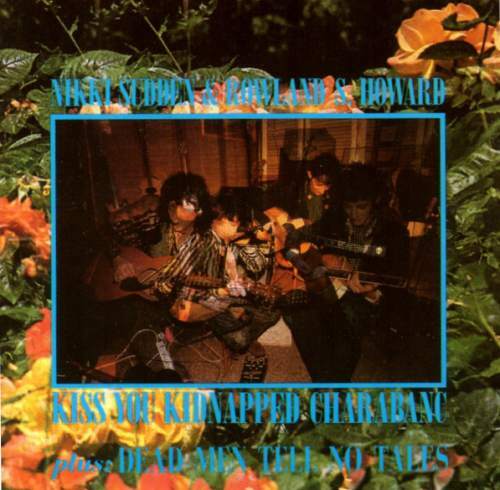 Line-up: "Kiss You": Nikki Sudden (vocals, guitar, bouzouki) and Rowland S.Howard (guitars, organ, dulcimer, harmonium, drums, bouzouki) with guests: Genevieve McGuckin (harmonium)/ Andrew Bean (drums) and Epic Soundtracks (drums, percussion). 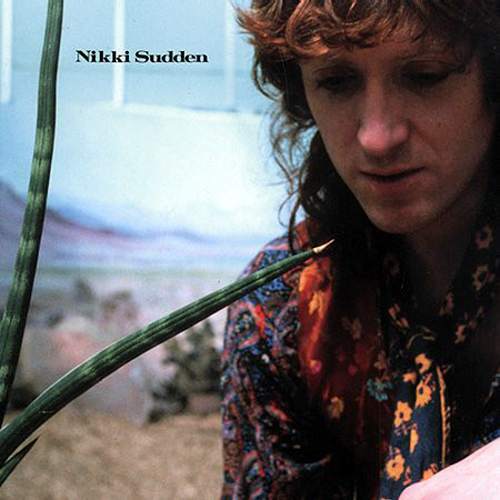 "Dead Men": Nikki Sudden (vocals, guitar, bouzouki, dulcimer, harmonium, piano) with guests: Duncan Sibbald (bass, acoustic guitar)/ Andrew Bean (tambourine, guitar) and (*) Rowland S.Howard (guitars, organ). "Live in Augsburg": Where The Rivers End/ Fortune Of Fame/ Death Is Hanging Over Me/ Wedding Hotel/ French Revolution Blues/ When The Rain Comes Down/ Johnny Smiled Slowly/ Back To The Coast/ Kiss At Dawn/ Big Store (Orig. )/ Crossroads/ Such A Little Girl. 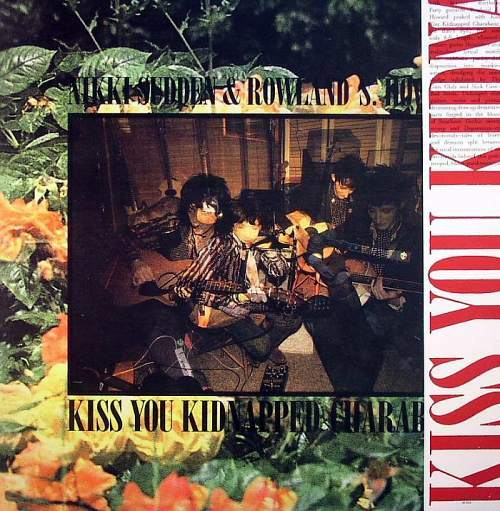 Recording info: "Kiss You": recorded @ (Fairport Dave Pegg’s) Woodworm Studio, Barford St. Michael (UK) between September and October 1986. Mixed between 09/12-Mar-87. Engineered by Tim Matyear. 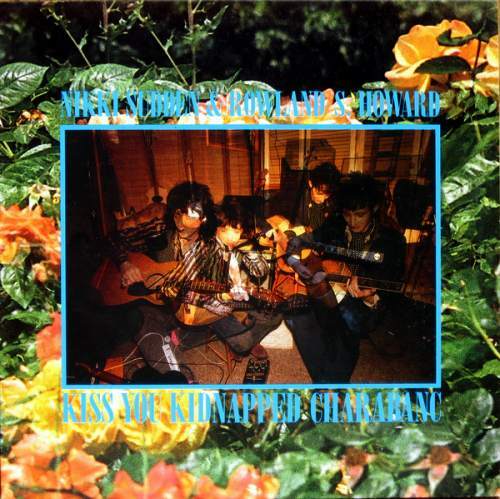 Produced by Nikki Sudden and Rowland S. Howard. "Wedding Hotel": remixing @ the Scarf Studio, Mile End-South London, by Tony Cohen during December 1986. 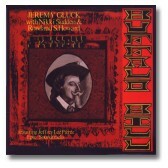 "Live In Augsburg": recorded live @ Siedlerhof, Augsburg (DE) on 18-Sep-87 by Peter Lübke. 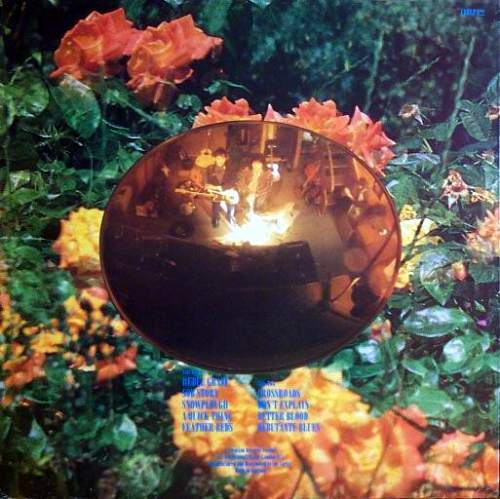 Remastered by John A. Rivers @ WSRS, Leamington Spa (UK) on 10-May-02. Studio line-up: Nikki Sudden (vocals, guitar, bouzouki) and Rowland S.Howard (guitars, organ, dulcimer, harmonium, drums, bouzouki) with guests: Genevieve McGuckin (harmonium)/ Andrew Bean (drums) and Epic Soundtracks (drums, percussion). Live line-up: Nikki Sudden (vocals, guitar)/ Rowland S.Howard (vocals, guitar)/ Duncan Sibbald (bass) and Desi Desperate (drums). 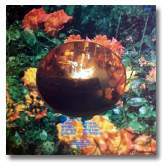 Note: Comes with 5 bonus tracks (+), inluding the "Wedding Hotel" 12" single and a live disc. Digitally remastered by Nikki Sudden and John A. Rivers @ WSRS in November 2000. Tracklist: Rebel Grave/ Sob Story/ Snowplough/ A Quick Thing/ Feather Beds// Crossroads/ Don't Explain [Arthur Herzog/Billie Holiday]/ Better Blood/ Debutante Blues. Recording info: Recorded @ (Fairport Dave Pegg’s) Woodworm Studio, Barford St. Michael (UK) between September and October 1986. Engineered by Tim Matyear. 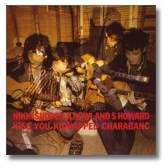 Produced by Nikki Sudden and Rowland S. Howard. 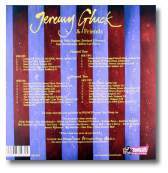 Tracklist: Disc I-Singles And Classic Album Tracks 1977-1989; Disc II-Singles And Classic Album Tracks 1991-2005; Disc III-Old, New, Lonesome And Blue; Disc IV-Beau Geste, Lost Souls And Bedroom Concertos: a.o. "Behind These Walls"; Disc V-The Dark Ends And The Dives; Disc VI-Across The Airwaves . Recording info: "Behind These Walls" recorded @ (Fairport Dave Pegg’s) Woodworm Studio, Barford St. Michael (UK) on 14-Oct-86. Mixed between 09/12-Mar-87. Engineered by Tim Matyear. 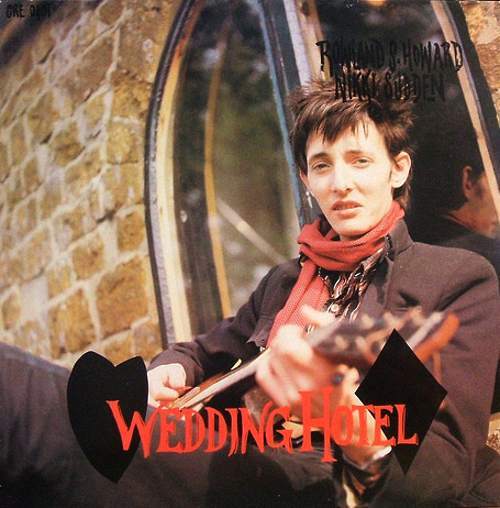 Produced by Nikki Sudden and Rowland S. Howard. 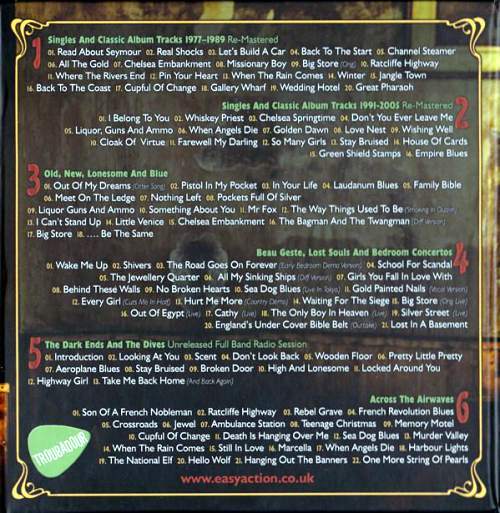 Note: 6 CD Box compilation, comes with a 30 page booklet. 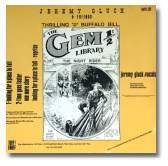 "Behind These Walls" is a leftover from the "Kiss You Kidnapped Charabanc" sessions, and only available on this release. 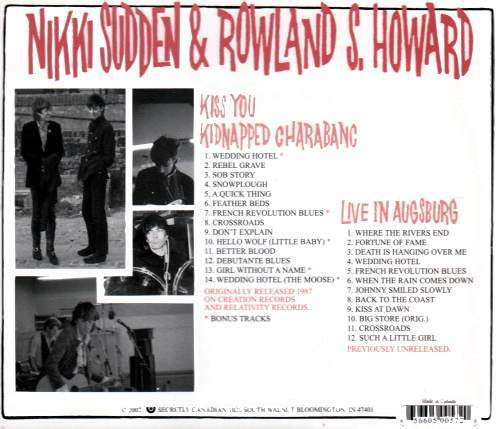 Line-up: Nikki Sudden (vocals, guitar) and Rowland S.Howard (guitars) with guest: Andrew Bean (drums). 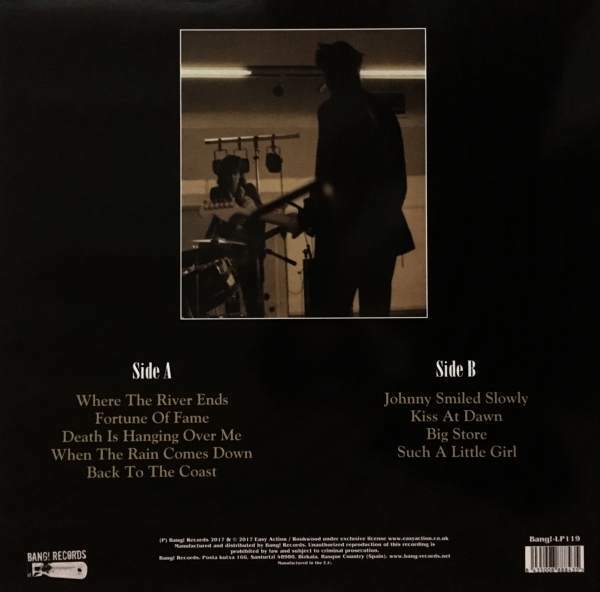 Tracklist: Where The Rivers End/ Fortune Of Fame/ Death Is Hanging Over Me/ When The Rain Comes Down/ Back To The Coast// Johnny Smiled Slowly/ Kiss At Dawn/ Big Store (Orig. )/ Such A Little Girl . 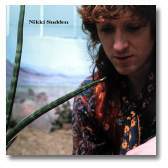 Recording info: Recorded live @ Siedlerhof, Augsburg (DE) on 18-Sep-87 by Peter Lübke. 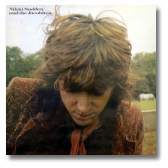 Remastered by John A. Rivers @ WSRS, Leamington Spa (UK) on 10-May-02. Remastered for vinyl Sergio Delgado @ Estudios Euram, Madrid (ES) 2017. 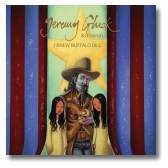 Note: Vinyl version of the "Live In Augsburg" CD (Secretly Canadian 2002), minus 3 tracks: "Wedding Hotel", "French Revolution Blues" and "Crossroads". Bang! 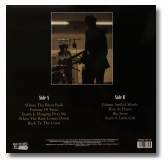 Records - LP119 (ES,22-Dec-17) Ltd. 500 copies, (150 gram vinyl). Last modified 31st of December, 2017.